From October through June, the Frederic Remington Art Museum offers monthly classes for homeschool families and groups. 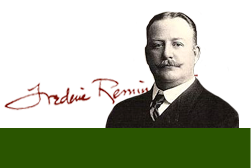 Classes will use the work of Frederic Remington to explore a wide range of topics in and approaches to the study of art, art history, and visual culture. Each class will begin in the Museum galleries, where students will engage with selected artworks to explore a given topic. The class will then move to the classroom of the Eva Caten Remington Education Center for a hands-on activity that will build upon the conversations in the galleries. This program is intended for children ages 6 and over. We emphasize collaboration among students of various ages, and learning through social interactions. Classes are held on the third Thursday of each month, and are $3/student for each class session; class fee includes materials and Museum admission. Enrollment is limited to 20; registration is on a first-come, first-served basis. You can register online HERE, or by calling 315-393-2425. For more information email Laura Desmond, Education Specialist, or call her at 315-393-2425.